When you think of a gaming keyboard, the first thing that comes to mind is lots of bright lights, extra buttons, and weird designs. That may be true of many keyboards on the market, but Logitech took a deliberately different approach to the G810 Orion Spectrum. Logitech says that the G810 is focused more on performance than looks, and its appearance certainly attests to this. At first glance, you'd be forgiven for thinking that the G810 wasn't a gaming keyboard at all. It's kind of plain-looking, and the numerous macro keys (called "G-keys" in earlier models), the wrist rest, and the exotic designs of the past are all missing. In their place is a keyboard that you could almost call austere. The G810's perfectly rectangular design features a matte black plastic top, with a polished plastic finish around the sides. Underneath, you'll find rubber non-slip feet and two feet on each side, allowing you to adjust the keyboard to the typing angle you prefer: zero, four, or eight degrees. You'll also notice that the keyboard feels very solid, thanks to a solid steel plate inside. In short, it has the heft you'd expect from a high-end mechanical keyboard. The most important feature of any mechanical keyboard is the switches. The G810 uses Logitech's proprietary Romer-G switches that feature a faster actuation than Cherry switches. More importantly for me, the switches are easily the quietest of any mechanical keyboard I have used. If you're a fan of the feel of a mechanical keyboard but can't stand the clicky sound, these are the switches you want. Plus, Logitech claims that they have a 40% longer lifespan than other switches, having been tested to 70 million keystrokes. They also chose to use classic keycaps on the G810, instead of the much-maligned faceted keycaps found on the G910. As with the G910 before it, the G810 allows users to set up the backlighting however they like. In fact, the Romer-G switches help facilitate this, as they allow the lighting to sent up through the center of the switch, instead of around it. This means there's almost no light bleed around the keys, which is a key feature if you're going to indulge your ability to light every key individually. You can also arrange the lighting in zones, use various color effects, and even have the backlighting respond to onscreen events in your games. Logitech has support for over 300 of the most popular games in their software already, and they're making the SDK available to developers as well. They've even partnered with Ubisoft to not only have special lighting profiles pre-installed for The Division, but to include a copy of Ubi's upcoming open-world shooter with every G810 sold. As mentioned before, Logitech's ubiquitous G-keys are missing from the G810. That doesn't mean that you can't use the keyboard for gaming macros, though. In their place, all 12 of the F-keys can be programmed with macros, and thanks to Logitech's software, those macros can be loaded automatically when you launch a supported game. It's fairly simple to set up these macros, and you can have the keys do anything from inserting blocks of text to triggering in-game actions. Also missing from the keyboard are USB passthrough ports. If you're used to plugging your peripherals into your keyboard (like you could on the G710+), you'll have to find a port somewhere else. The only noticeable extras on the G810 are the media, lighting, and game mode buttons. Unfortunately, they're also the worst part of the keyboard. They have little travel and a very "clicky" sound and feel. The media keys on the G910 are far superior. There's also a volume control wheel, which rolls just as smoothly as always on Logitech keyboards. In fact, the very lack of extras is what sets the G810 apart. 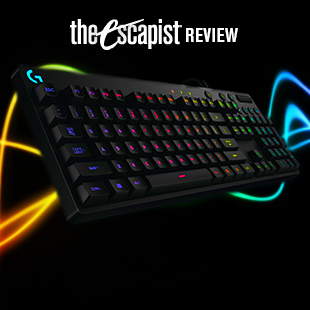 It's a gaming keyboard that doesn't look like a gaming keyboard, and that's not necessarily a bad thing. It's a keyboard that's equally at home with your Monday afternoon meeting or your frantic Friday night Starcraft sessions. Logitech's software is as solid as always, allowing you complete control over not just the keyboard's performance, but its appearance. Its $159 price point may sounds a bit steep, but it's largely in line with other mechanical keyboards of this type. It may not have the usual bells and whistles, but it's a great keyboard for any gamer that's looking for something a bit understated. Bottom Line: The Logitech G810 is a solid offering that packs the features of a top-end mechanical keyboard into an attractive, unassuming package. Recommendation: If you're in the market for a new gaming keyboard, and you want something powerful but not flashy, the G810 is right up your alley.